1) Tokyopop's website. After all, this is the company that is bringing us the ANIME AND MANGA versions. In the US, all anime volumes and related box sets are released. Other region releases can vary. Check with your local retailer for availability. Section first created on: June 1, 2003. This particular section was last updated on: August 7, 2007. DISCLAIMER:Great Teacher Onizuka/GTO belongs to the original creator Tohru Fujisawa, and all related companies involved with GTO(like Tokyopop, etc). I do not own any of this! 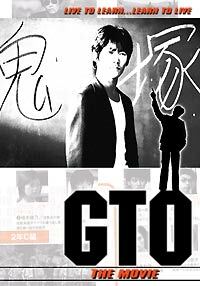 This page was created for entertainment/informative purposes only/ as part of a GTO fansite. If there is a problem with this, or any other part of the GTO part of my website, please do not hesistate to contact me here and I will promptly remedy the situation. No harm is intended by the creation, maintenance, and existence of this page. Click here to go back to the library. Anime Back cover: Episode description as found on the back of the DVD/VHS Cover. 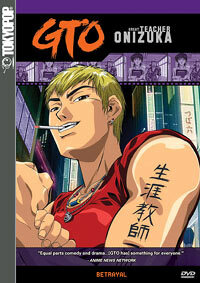 Volume 1: "Great Teacher Onizuka"
Onizuka is assigned to teach a class of juvenile delinquents. In the class, he meets the beautiful, young Nanako Mizuki. He invites her to his place, but finds out it was a plot set up by the class to blackmail him. Back cover: "Onizuka turns the tables on blackmailing students." Onizuka decides to interview for a teaching position at the prestigious Holy Forest School. On the day of the interview, Onizuka rescues a cute young girl from the Holy Forest's vice principal, Hiroshi Uchiyamada! Back cover: "Interviewing at Holy Forest Academy, Onizuka meets his nemesis." As a new term begins at Holy Forest, Onizuka begins his lifelong dream of running a class. Unfortunately, Onizuka learns that everybody who has taught his new class has left because of the mental stress. Back cover: "A bullied student is befriended by Onizuka." A disturbing picture of Onizuka is going around school. Onizuka starts to worry about himself, thinking he might have multiple personalities. The truth is, his students are plotting against him. Back cover: "Phony photos embarass teachers until Onizuka takes action." Back to the release info menu. 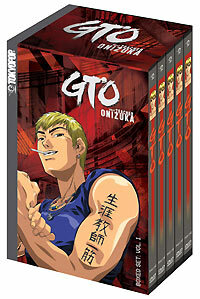 >10.11.05 *PICTURE OF BUNDLE FORTHCOMING* A SPECIAL BUNDLE COMPRISING THE 1ST VOLUME OF THE GTO MANGA AND THE 1ST DVD OF THE GTO ANIME - WHAT A GREAT WAY TO BREAK INTO ONE OF THE BREAKWAY HITS OF RECENT YEARS! Meet Eikichi Onizuka, a 22-year old college karate champ and ex-biker. He's crude, foul-mouthed, and has a hair-trigger temper. Just the sort of guy you'd expect to see going back to school ... to become a teacher! **For Volume 1 DVD Features, refer to information in the Volume 1 section above. Back cover: "Onizuka takes revenge on a group of bulies in his own way." Back cover: "The PTA threatens to fire Onizuka." Back cover: "When Onizuka visits a student's single mother, it brings nothing but trouble." Back cover: "Punks force Murai to jump for the honor of his mother." Back cover: "The PE teacher Fukuroda challenges Onizuka." Tomoko Nomura is an outcast in Onizuka's class - concerned about her, Onizuka tries to teach her how to have more confidence. Back cover: "After Nomura is shunned by her classmates, GTO helps out. Back cover: "Onizuka coaches Nomura for her audition to be a popstar. Back cover: "A rival math teacher plots to have Onizuka fired. Back cover: "Onizuka must obtain his credentials after being placed on probation." Back cover: "Onizuka gets the wrong idea when Fuyutsuki helps him study." >>The first version of Volume 3's cover had Tomoko's picture on the side. The 'rerelease' version has a red bar down the side where there was none before... plus Tomoko's picture has been released by one of Onizuka. Onizuka breaks up a kidnapping, ruining his own test. Teacher Killer Urumi Kanzaki makes her 1st appearance. Urumi finally opens up to Onizuka ... on a rooftop. Onizuka is blackmailed into buying a sushi feast with no cash. Holy Forest Academy is under siege from Urumi's dangerous pranks. One day, a love letter is found in Murai's shoe box with the initial 'F' on the envelope. A female student, Kujirawaka, put the letter in his box as a favor to one of her friends. However, Fuyumi Kujirakawa's initial is also 'F.' Kusano and Fujiyoshi think that the love letter is from Kujirakawa, but, in fact, it is from Akane Fujita, Fuyumi's friend. Back cover: "A love letter is found in Murai's shoe box with the initial "F" on the envelope." Fuyutsuki, young and beautiful, is popular among male students. And, of course, female students dislike her just as intensely. One day, the girls finally kick her out of class. Losing her confidence, Fuyutsuki runs away from school. Onizuka heads toward Hakuba, Fuyutsuki's special memorial place, taking Kikuchi, Murai, and Toroko, with him. Back cover: "The female students boycott Fuyutsuki's class." A film crew decides to blow up an old school building where Fuyutsuki and Hitomi share a lot of memories. At first Hitomi feels betrayed by a former teacher whom she trusted, but Onizuka somehow succeeds in talking her through her problems. Even so, she decides to act out and sneaks into the school building filled with explosives. Back cover: "A film crew plans to blow up an old school building." There is an epidemic of threatening superstitious mail at Holy Forest Academy. Onizuka himself receives a pile of cursed letters. But having no interest in any form of superstition, he burns them all. Next day, ominous incidents begin to befall him, and eventually he becomes ill.
Back cover: "Onizuka burns a pile of cursed chain letters, and experiences many ominous incidents." 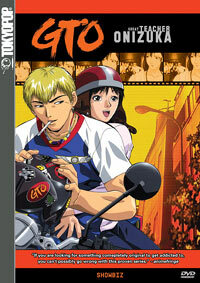 Includes DVD Volumes 1 through 5, A High-Quality Artbox and a Great Teacher Onizuka T-Shirt! Meet Eikichi Onizuka, age 22. A former leader of the infamous Onibaku biker-gang with his heart set on becoming Japan's Greatest Teacher! In peak physical condition and wielding an iron code of ethics, he may just have what it takes... or so one would think. Finding employment at the prestigious Holy Forest Academy, he soon learns that teaching isn't easy when you have a class full of delinquents that what nothing more to see you fired... and while Onizuka may seem like a nice guy most of the time - he's not afraid of turning Holy Forest into the School of Hardknocks! **For specific DVD Features/Extras, refer to Volume 1-5 listings. >>Note that the 'sides' of the DVD Volume Covers may vary. You may get the original covers for Volumes 1, 2, and 3 ~or~ the newer revised ones (the one with an actual color bar and pictures of Onizuka replacing Murai's (on volume 2) and Tomoko's (on volume 3)) ~or~ a mix & match/combination. This means that your GTO collection will look 'weird' and 'irregular' based on the side covers alone. Includes the first 23 episodes from the original release DVD Volumes 1 through 5. In May 22, 2006, Funimation had announced that it had aquired the exclusive North American Rights to distribute for select titles from Tokyopop's video collection. Read press release from Anime News Network here. Amongst the titles were Initial D and of course Great Teacher Onizuka. The series has new life, so to speak, being rereleased by Funimation in 2007. Don't worry, the show wasn't redubbed or changed, just repackaged and released! And it's definitely more affordable than before. If you missed out on your chance the first time, then now's your chance! With each volume about $10 (depending on where you buy the whole box set of course), this is an nice way to add this great title to your collection. Former juvenile delinquent Onizuka finds himself thrust into a role of high school teacher, facing students who behave just as he used to and an administration that doesn't trust him. Using the brash and unorthodox methods he picked up in his youth, Onizuka manages to reach through to his kids and help them with their problems. Great Tutor Onizuka takes on a new assignment ... Uchiyamada's daughter! Back cover: "Great Tutor Onizuka teaches Uchiyamada's daughter." Holy Forest Academy gets a new nurse. The last stand of a street racer. Back cover: "A street racer's last stand." William Morris, move over ... Onizuka tries his hand at being a talent agent. 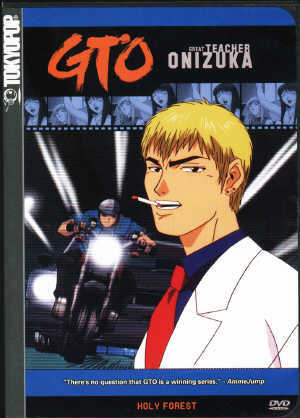 Back cover: "Onizuka tries his hand at being a talent agent." Tomoko is exposed to the harsh reality of professional pageantry. Onizuka's students learn the fine art of embezzlement. 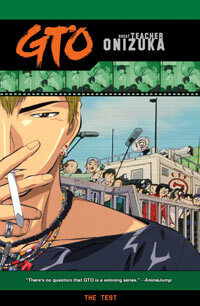 Onizuka tracks down a missing student after he is accused of theft. To make up for past mistakes, Onizuka promises to take the entire class to Okinawa. Onizuka goes for broke and gambles his future on one raffle ticket ... and, in true Onizukan fashion, proceeds, of course, to win a Mercedes E430 - the sale of which more than covers the money for the student trip Okinawa. Back cover: "Onizuka goes for broke and gambles his future on one raffle ticket." Miyabi must choose between her pride and a fate worse than death. A person from Onizuka's past stirs up controversy within the ranks of Japan's finest. Plus a little fleeing-the-Yakuza thrown in for good measure. Back cover: "A person from Onizuka's past stirs up controversy within the ranks of Japan's finest." Murai suspects a secret wedding when he spies his mother at a bridal boutique. Back cover: Fuyutsuki prepares for the big trip to Okinawa. Even on a field trip, Yoshikawa has to deal with the requisite bullying by Anko. Back cover: Onizuka stirs up controversy when he tampers with room assignments. Blinded by his greed, Onizuka forces his students to search for a treasure thought to be exist somewhere on Ishigaki island ... and rumored to be worth 2 trillion yen! Back cover: Blinded by greed, Onizuka leads a treasure hunting class. Yoshikawa and Anko share a life-threatening experience; totally ignorant of their plight, Onizuka continues his mad quest for the treasure. Back cover: Yoshikawa and Anko must rely on each other for survial after an accidents leaves them stranded. Actual DVD Features: = · 2 Bonus Easter Eggs - Fujisawa-san at Comicon & Behind the Scenes with Wendee Lee (discussion of her roles in Tokyopop releases)! >>Want to find them? If a notice isn't held up by tape or staples, then what's holding it up? Two of these things are doing more than they were intended for. Anko sorts out her feelings for Yoshikawa; while the Vice-Principal experiences a rejuvenation of his love for teaching. Back cover: Anko and Yoshikawa's relationship blossoms as the vice-prinicpal regains his drive to teach. Back cover: Onizuka leads Anko and Yoshikawa on the path of love. Noboru Saito - last year's homeroom teacher - is the victim of a horrible assault ... and suspicion falls on Miyabi. Back cover: A person from class 3-4's past may have a connection with Miyabi's strange behavior. Onizuka leads students and teachers in a vigorous defense of Miyabi; in the process he ruffles more than a few feathers and, of course, puts his job on the line once last time. 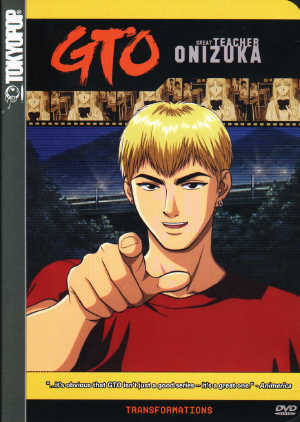 Back cover: Onizuka must use everything he has to save Miyabi from the Board of Education. Lesson 46 "How to be a Perv"
Lesson 48 "Good Nutrition & Fashion"
Lesson 50 "How (Not) To Attract A Woman"
Lesson 51 "The Student Body"
>>You should never disregard your class schedule... even if it's Lesson 43... this late in the school year/season. You never know ... always take a peek once a while. Things DO change you know... and can change right under your nose. The hit anime series continues in this collectible boxed set! See the shocking series finale that will either end Onizuka's career, or catapult him into the spotlight as the Greatest Teacher in the World! ADDED BONUS! 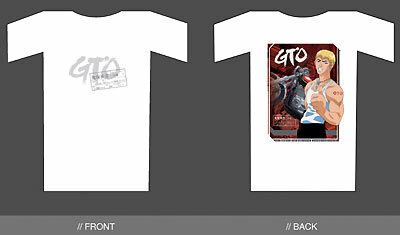 Free GTO T-Shirt In Every Box! >>Despite the fact that Tokyopop advertises it, be aware that there were NO character sketches extras in Anime Volumes 6-10. **For specific DVD Features/Extras, refer to Volume 6-10 listings. Includes the remaining 21 episodes from the original release DVD Volumes 6 through 10. And it's definitely more affordable than before. If you missed out on your chance the first time, then now's your chance! With each volume about $10 (depending on where you buy the whole box set of course), this is an nice way to add this great title to your collection, or in this case FINISH your GTO (Anime Version) collection! Brought to the US by Media Blasters, under their "TOKYOSHOCK" label. 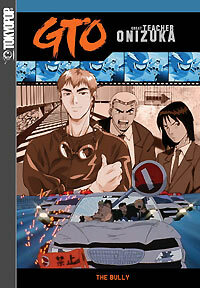 This is a sequel (of sorts) to the 12 episode GTO Live-Action TV series-which CURRENTLY IS NOT available in the US. This GTO fansite does mention the Live-Action/Drama Version in certain areas. 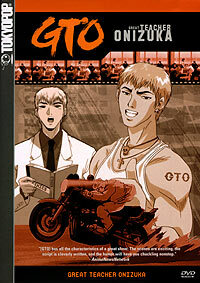 GTO is an ex-biker punk who's taken on the formidable job of teaching high school. Lucky for him, street smarts and martial arts are just what the job needs. Like a cross between a thug and a walking, talking after school special, GTO will go to any length to help his kids. However, his career might be in jeopardy when he's mistaken for a serial thief! It's the first of GTO's live action franchises.